Restaurant’s virtuoso chef is a maestro in the kitchen. A CHEF’S virtuosity is seen in his creative ability to use local and imported produce to create an impression on the plate, and the palate. For chef Evert Onderbeke, working with fresh local ingredients allows him to get creative in using his knowledge on food and cuisine to impress diners. The Belgian chef’s initial step into the world of culinary arts began at the famous culinary school Ter Duinen in Koksijde, Belgium when he was 15 years old. Having worked in New York with Belgian chef Steven Debruyn as well as chef Roger Souvereyns and chef Wout Bru, Onderbeke unleashes his creative use of ingredients by maintaining a commitment to high standards and quality dining at Soleil. Onderbeke changes the menu every three months to keep diners’ tuned in to the restaurant’s latest offering of European dishes with an Asian touch. An example of his inventiveness is in the Pan Fried Hokkaido Scallops with Helianti Puree, Shimeiji Mushrooms and Walnut Dressing (RM50); Grilled Stuffed Squid with Prawns and Fine Vegetables (RM40) and Seafood Emulsion and Marinated Crabmeat with Avocado, Momotaro and Basil Sorbet (RM45). While appreciating the simplicity of these appetisers, we wondered about the whitish bed of helianti mash that the scallop sat on. “Helianti is a long forgotten tuber vegetable that bears resemblance to the Jerusalem artichoke. 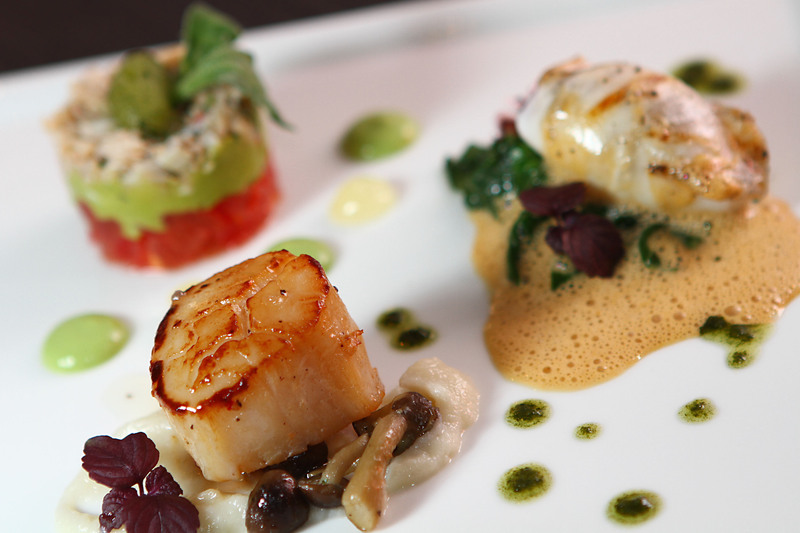 “Its starchy consistency makes it an ideal pairing with scallop,” said Onderbeke. Sommelier Yuhei Teraoka pitched in to arouse our tastebuds with the Seafood Symphony (RM50) featuring four slender shot glasses of Tequila with Frozen Yuzu Margarita with Fresh Oyster; Frozen Virgin Mojito with Grilled Squid; Momotaro Gazpacho with Tuna Tartar and Frozen Asam Laksa with Grilled Prawn. The tart and heady yuzu juice gave the Tequila with Frozen Yuzu Margarita with Fresh Oyster its prominent citrus taste, with sugar, honey and tequila adding a refreshing balance to the cocktail. The mojito’s distinct mix of fresh lime, gula Melaka and mint was the perfect vehicle to accentuate the squid while the Momotaro tomatoes in the gazpacho impresses with its fresh acidity and sweetness. Teraoka said ginger flower, Thai chilli, tamarind, lemongrass, plum liquer and vodka are blended together, to derive a near likeness to assam laksa. Expecting the explosive flavours of spicy and sour notes, the concoction was a pale comparison to the assam laksa robust flavour. Onderbeke’s forte for cooking seafood dishes came to light during his time at High Tide in Menara Taipan. We experienced his flair with seafood in the Mussel Pot with White Wine, Lemongrass and Herbs Butter (RM45), a simple fusion of flavours. The aroma of lemongrass lingered in the air, filling us with anticipation to taste the dish, which did not disappoint with faint herbalness obvious in each mussel. “I use dry white wine, lemon, taragon, parsley, chives and basil in this dish. “However, since mussels cook rather fast, there is little time for the flavours to infuse with the meat,” he said. While the mussels scored high with us, the inclusion of fermented soy beans (tempe)in the Herbs and Tempeh crusted Barramundi in Clear Lobster Broth with Prawn Dumpling and Broccollini (RM65) is an acquired liking. Opinions may differ but I found the herbs and tempeh crust rather overpowering, masking the delicate sweetness of the barramundi, which on its own, was perfectly cooked. Expecting the prawn dumpling to be a saving grace, its mix of prawn, carrot, celeriac, leek and fennel came across bland in a flavoursome lobster broth. “I enjoy eating tempe so why not use it on the fish. “It is good to pair the tempe with a local fish as imported fish is more delicate to handle the tempe,” Onderbeke said, adding that he prefered to keep his preparation for imported fish simple. Another dish that stood out is the Roasted Pigeon with Pan Seared Foie Gras, Sauteed Baby Spinach and Sweet Corn Croquettes (RM110). The dark pigeon meat is tender and pink with foie gras’ creaminess adding depth in flavour. Soleil’s dessert section has never failed to impress in the few times I have dined there and for our tasting pleasure, we relished Pandan Crepe with Banana and Gula Melaka, Coconut Sorbet (RM26) and Mango, Passion Fruit and Ginger Panna Cotta with Dragon Fruit Sorbet and Kumquat Confit (RM26), prepared by Soleil’s pastry specialist.